Nahid Hagigat is a visual artist who combines her paintings with her own life stories. After graduating in Fine Arts from Tehran University, Nahid continued her studies in the United States. She received her Ph.D. from New York University in Art and Art Education, specializing in painting and printmaking. 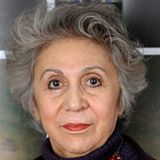 She often exhibited her art in Tehran and was instrumental in introducing printmaking to Tehran art galleries. She recently received her second Ph.D. from Huntington Pacific University in Art & Behavioral Therapy. Nahid has had multiple solo and group exhibitions in the United States. In addition, her work is in numerous private and public collections including the British Museum, Tehran Museum of Modern Art, JP Morgan-Chase New York, New York University, and World Bank in Washington, D.C. among others. Iran Modern, Asian Society, Sept 6, 2013 through Jan 5, 2014. Iran Modern is a landmark exhibition that is focusing on Iranian art created during the three decades leading up to the revolution of 1979. Nahid Hagigat lives and works in New York City, Manhattan.